Challenge: RFD-TV celebrity Ken McNabb wanted to increase product sales and instructional clinic bookings. The company had never undertaken a direct mail campaign and was unsure where to start. Solution: HSMG brought our years of experience in direct mail to bear in a hurry to help Ken traverse the confusing waters of what to mail, who to mail and when to mail. 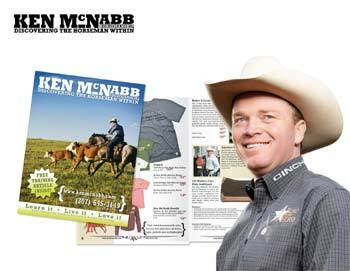 Because even the best direct mail campaign will have a percentage of non-responders, we wanted even non-responders to walk away with a sense of Ken's unique selling proposition and information that could "turn them to the respondent side" on a subsequent interaction with the McNabb Horsemanship brand. By coalescing product selection, effective layout and sales oriented copy, we created a compelling product catalog that resulted in a resoundingly successful sales boost. Challenge: With a dizzying array of competencies on offer, Health Service Associates' goal was two-fold: educate current clients unaware of the full breath of their services and attract new business. 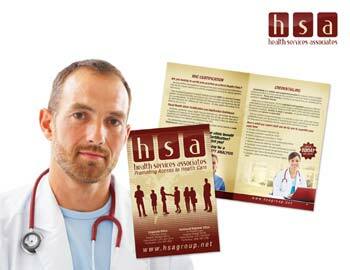 Solution: Stretching its wings into the health care industry, HSMG performed an extensive client interview to better understand the company's services and target demographic. Considering rising postal and print costs we took a shrewd approach to our direct mail strategy. By optimizing the size of the mailer to mail at the standard bulk rate and focusing on key services, Health Services Associates was able to stay within budget while raking in new prospects right, left and center. New customers... just what the doctor ordered for any bottom line.